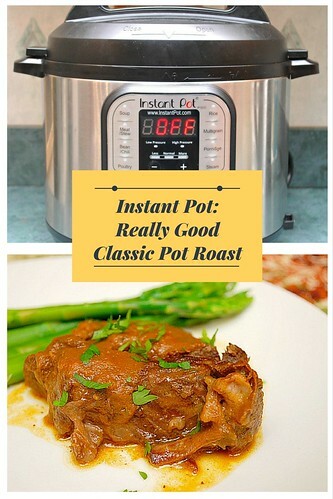 This recipe is quite different where I'm using my beloved Instant Pot where the vegetables are sautéed briefly. Broth, red wine, tomato paste, and aromatics join the vegetables. The meat is seasoned and then placed directly on the sautéed vegetables without browning. The lid is secured and pressured cooked until tender. But what really drew me towards this recipe was the gravy was made. Press SAUTE and add 1 tablespoon oil. Add the onions and cook until softened and they begin to brown. Add the carrots and celery; continue to cook, stirring occasionally, for 5 minutes longer. Add garlic and cook until fragrant. Stir in 1 cup of beef broth, 1/2 cup of wine, tomato paste, bay leaf, and thyme spring; bring to a simmer. Pat the beef dry with paper towels after it sat out for an hour. Season the roast generously with pepper, garlic powder and onion powder. Nestle the meat on top of the sautéed vegetables. Transfer the roast to a serving platter and tent loosely with a piece of foil. With the remaining sauce in the IP, strain the liquid through a mesh strainer and into a 4 cup liquid measuring cup. Allow the liquid to settle for 5 minutes, then skim any fat off the surface. Add beef broth to the strained liquid as necessary to bring the liquid amount to 3 cups. Place the liquid back into the IP insert (which does not need to be cleaned). Discard the bay leaf and thyme sprig. Transfer the vegetables back into the IP. Using an immersion blender, blend the vegetables and liquid in the pot until smooth. Press SAUTE and bring the liquid to a simmer over medium heat. Stir in thyme, remaining 1/4 cup wine, and balsamic vinegar into the sauce and season to taste with salt and pepper. 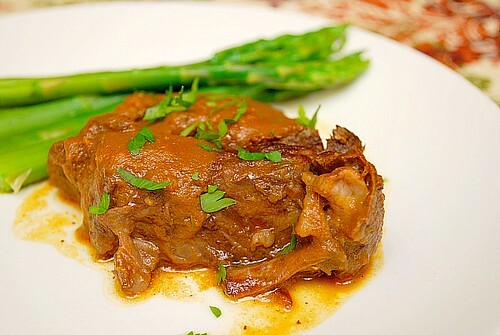 Spoon half of the sauce over the plated roast and serve the roast with extra sauce on the side.